About the Holiday - Existence Day. A day for celebrating life. Instilling some gratitude in our collective attitude. Existence Day began with a casual conversation about our myopic perspective of our overly routine world. That discussion about modern life and the seemingly endless drive to acquire more led to the realization that we often overlook the abundance of awesomeness that surrounds us. Hence the idea was born, and a mission lay ahead: to bring a day for which people all over the world could layabout in the splendor that is our universe. 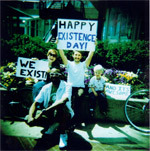 The concept of existence day was first brought out to the public in 2009 with a demonstration held in the streets of Baltimore, Maryland. The succeeding celebration in 2010 involved an even bigger demonstration and included an after-party where supporters were able to come together to celebrate. The holiday has continued to gain momentum and evolve throughout the years, inspiring bigger and better future celebrations. In 2011, a Costumed Bicycle Caravan was held and fun was had by many. We rode a 12 mile expertly planned path around Baltimore, MD spreading that good-life cheer. We also revamped the website and have gotten the ball rolling on our 501(c)3 non-profit status. 2012 will be a respite year for Existence Day's main organizers, but don't let that stop you from celebrating being alive! Look at the Idea Cloud, or plan an event and let us know! We'll be sure to share it with our fans. What do you want it to be? Existence day is just starting out; it’s traditions are yet to be defined. We dream of Existence Day being an internationally celebrated holiday which unites us through local parties and events all over the globe. We’re constantly conjuring up new ideas on how to celebrate and spread the revelry throughout the world. Help us shape the future of Existence Day. We are an ever-growing team of passionate people who are inspired by the awesomeness of existence, and are dedicated to creating a means by which to share it with the world. Want to get in touch? Send us a note at existenceday@gmail.com.